We’ve driven a few electric vehicles and can’t help feeling that Renault’s real motivation has more to do with marketing hoopla than any real need to re-educate drivers. There’s actually markedly less to do in most EVs than in their fossil-fuelled equivalents. Most don’t have gears, for example. All use regenerative braking to replicate or supersede the engine braking we are all used to from conventional cars, meaning that you use the brake pedal in much the same way or less. The steering wheel is a pretty standard device, as are mirrors, tyres, seats and belts. So unless Renault has done something bizarre we don’t know about, the test-drive programme must surely be more about re-aligning expectations than driving habits. It wants us (and its rivals) to know that its cars are nearly here, and it’s confident in its product plans. Those plans include three cars in 2011. The first two will be current vehicles that will have undergone a heart and lung transplant, ditching the fuel tank and engine in favour of lithium-ion battery pack and electric motor. 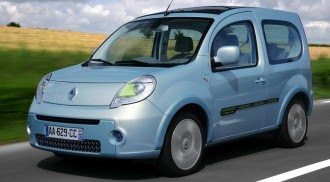 One will be the previously announced Kangoo Express ZE, due in the middle of 2011, the other will be a family estate car. These will be followed later in the year by a bespoke electric urban car, and in 2012 by a compact hatchback EV.